Preheat oven to 400°F. Arrange carrots and shallots in an even layer in a large, heavy roasting pan. Melt 2 tablespoons butter in a small skillet over medium. Drizzle melted butter and olive oil over vegetables, and sprinkle with 1 teaspoon salt. Roast in preheated oven until vegetables are slightly caramelized, about 20 minutes. Remove from oven and add broth to pan. Whisk together 1/2 cup saba, 3 tablespoons Dijon, and remaining 1 teaspoon salt in a small bowl. Place ham, bone side up, on a work surface. Nestle rosemary sprigs between slices, and place ham on top of vegetables in roasting pan. Brush ham liberally with one-third of saba mixture. Roast ham in preheated oven 5 minutes, and brush with half of remaining saba mixture. Reduce oven temperature to 250°F and roast ham until warmed through, about 25 minutes. Brush with remaining saba mixture, and increase oven temperature to 450°F. Roast until glaze is sizzling, about 5 minutes. 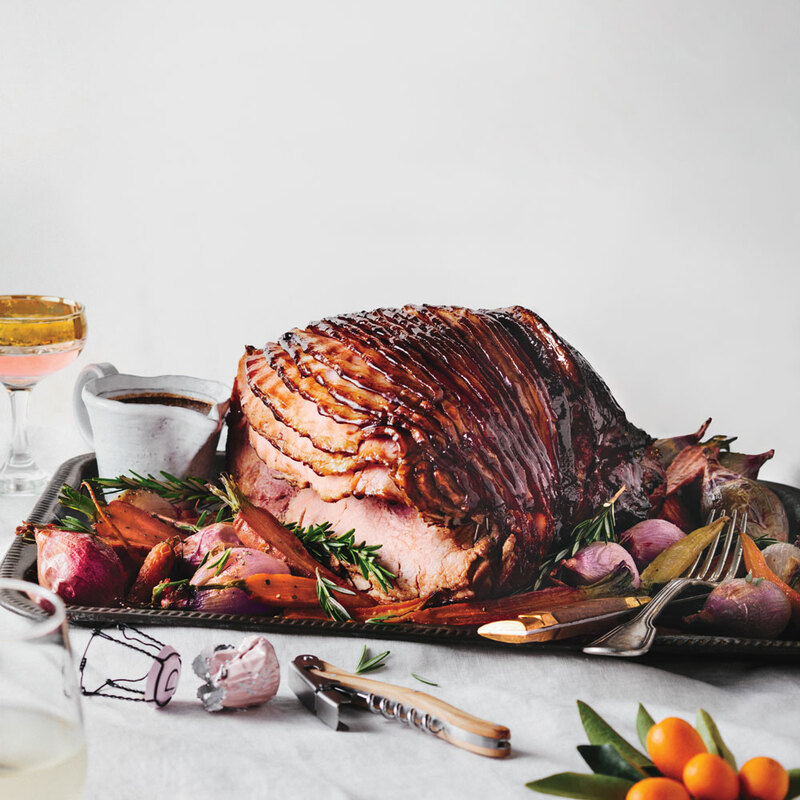 Place ham on a serving platter, and arrange vegetables around ham; tent with foil. Heat pan drippings in a small saucepan over low. Stir in remaining 2 tablespoons Dijon, remaining 2 tablespoons butter, sesame seeds, and vinegar. Cook, stirring, unitl warmed through, about 5 minutes. Serve with ham and vegetables.